As Technical Director for Legend Films I hired Lethal Sounds to record voice commentary for RiffTrax.com and Mike Nelson of Mystery Science Theater 3000. Rick is an outstanding audio engineer with an amazing understanding of both audio and video production methods. He has great communication skills and is a pleasure to work with. Due to Rick's incredible understanding of voice recording and our core product we frequently re-arrange our production schedule to ensure we only work with him, because we know he will always get it right. It’s been awhile since our last post, but we have been busy the last few months with many projects. Lethal Sounds has provided audio and video for Achieve3000 and National Geographic, for their online middle school project. We’ve also have been working with Awaken Interactive in Irvine on couple of their projects as well as the Scantron Corporation. 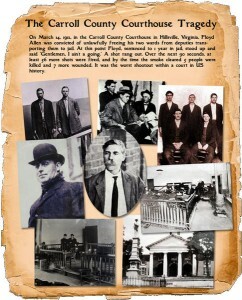 Plus we are in post-production for the documentary Hillsville 1912: A Shooting in the Court. Here is an excerpt from a recent article in the Galax Gazette Newspaper, located in Galax, Virginia about the documentary. After nearly 100 years, the dramatic moments in the historic Carroll County Courthouse will finally get some screen time in two productions. Two filmmakers with local ties have undertaken efforts to tell what happened in the deadly gun battle that took place in the courtroom March 14, 1912, between members of the Allen family, court officers and county officials. While many books have been published on the incident that left five people dead and seven injured — including Bill Lord’s “The Red Ear of Corn” and Ron Hall’s “The Carroll County Courthouse Tragedy” — Hollywood has overlooked the feud in Hillsville. Shadowdog Productions of Greensboro, N.C. — headed up by a man who shares his name with a person involved in the shootout — intends to change that by making a short film about the trial of Floyd Allen where all hell broke loose. He and director John Foutz hope the film will garner enough attention and support to fund a feature film. From the West Coast, Backyard Green Films’ Rick Bowman has conducted interviews with many of the leading local historians to compile a 60-minute documentary he hopes to air on either cable or public television. Growing up in Laurel Fork, Rick Bowman remembers family members talking “in hushed tones” about the shootout that left five dead and seven injured. He could remember looking at the photos of those killed, hanging on the courthouse wall. Bowman read the book written by Rufus Gardner, and bought books on the shootout they had for sale at the local five-and-dime and studied them. That question stuck with him even after his family moved to Florida, he joined the armed services and ended up as a filmmaker and recording studio owner in San Diego. Bowman still has many of the books on the subject, which he loans out to friends who hear of the shootout from him and get interested in it. “And they say, ‘Really? All those guns were in the courthouse that day?’” Bowman said. To prepare his documentary, Bowman got in touch with Carroll’s leading historians and recorded interviews with them — artist Ron Leonard, authors Ron Hall and Bill Lord and the late museum owner and shootout archivist Gooch Harmon. These people spent much of their lives researching the history, he noted. Lord kept at his research even after his book came out, and shared with Bowman a different theory about how the feud started. Authorities received a complaint, possibly in 1908, from a Noah Combs that Floyd Allen had taken a shot at him one day because of a piece of land that Combs owned that Floyd wanted but failed to get, Lord told Bowman. Lord believes that’s when the authorities began scrutinizing Floyd more. Bowman just wanted to learn more about the incident and to tell the story to a larger audience. That’s why he’s creating the documentary to offer to the Discovery Channel, the History Channel or PBS. “Really, outside of Southwest Virginia, not a lot of people have really heard about this,” he said. The event led to a massive manhunt for the escaped Allens, and the sensationalized story dominated newspapers in 1912 — at least until it was topped by a bigger story, the sinking of the Titanic..
One thing Bowman has learned about what happened inside the courtroom that day is that there are so many stories that nobody really knows what went on. Some witnesses — who were no doubt scrambling away from the gun battle as quickly as possible — reported seeing different people shoot first. Some said Dexter Goad fired the first shot. Others said it was the sheriff, and there are those who thought it was Claude Allen. “After 100 years, unless somebody can come out with a different kind of evidence, we’ll never know what happened,” Bowman said. Then there was the testimony from the following trials of Floyd and Claude Allen, the two family members executed in the aftermath — Dexter Goad admitted having a gun and using it. By law, only the sheriff and his deputies had a right to be armed in the courtroom, but the county officials and Allen family members had guns, too. Bowman contacted Allen family members to participate in the interviews, but they declined. He had hoped they would want to give the other side of the story, as history seems to accept that the Allens were the bad guys. Their reluctance shows that, after a century, the incident continues to affect peoples’ everyday lives. “I hope people look at it from a historical outlook as something that happened, and I hope they enjoy the film,” he said. Bowman plans to have a premiere of the documentary in the Twin Counties, perhaps at the Rex Theater in downtown Galax, as he plans to roll the production out at film festivals. He’s scoring the film with the song “The Ballad of Claude Allen” and variations on its theme. That’s almost complete and he’s hoping that post-production will wrap up by the end of June. Bowman said he’d be happy to give advice to any other filmmakers who approach the story of the courthouse shooting. Lethal Sounds (as Backyard Green Films) is fully responsible for all aspects of the production, from producing, directing, shooting and recording, and sound design for the historical documentary Hillsville 1912: A Shooting in the Court, concerning the Carroll County Courthouse shootings that occurred in Hillsville, Virginia.